Are you one of the millions of adults who either hide their smile or simply never shows it? Now the answer to your concerns, Six Month Smiles®, can be found right here in Roseville. A smile is one of the main ways we express happiness and interact positively with others. Research shows that smiling is good for your health. It reduces stress, can change your mood and helps to give you a more positive perspective on your day. As specialists in Cosmetic Dentistry, we understand that people may have a misconception that this type of dentistry is just for the rich and famous—celebrity types; when in fact cosmetic dentistry is so much more than giving you a runway smile. We have seen quite a few patients over the years become more self-confident, more radiant and more willing to show off their smile in social situations by having fixed chipped teeth or having closed spaces with veneers. As professionals and parents we understand that timing and waiting to see results is not something that a lot of our patients can spare. That is why we are proud to now be providing Six Month Smiles®. Six Month Smiles® short term orthodontic treatment is a modern twist on tried-and-true orthodontics. There is little debate within the orthodontic community that braces are the most widely used and most effective method to give patients straight, healthy teeth and a beautiful smile. Six Month Smiles® has taken the best aspects of braces and modified the treatment and the materials to give adults a common-sense, cosmetic solution that fits your lifestyle. 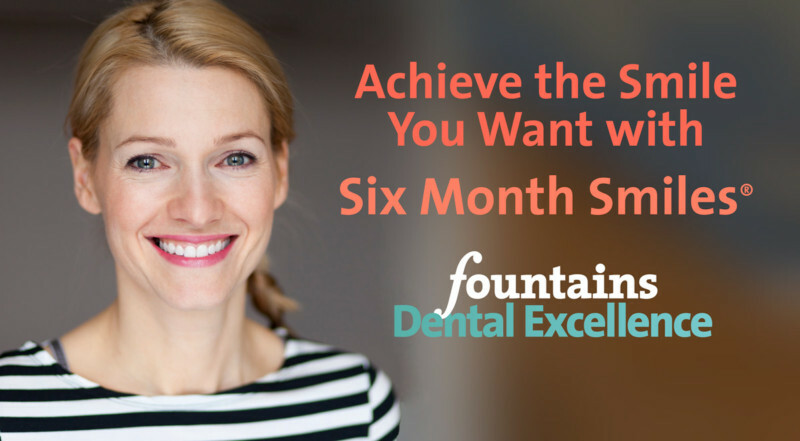 Interested in learning more about Six Month Smiles® and seeing if it is the right choice for you? Please contact our practice to schedule a consultation, 916-780-3000. We are happy to answer any questions and concerns that you may have.